By the 1850s, San Francisco's growing population looked to the northwest corner for less expensive real estate on which to bury its dead. Laurel Hill, the first of four cemeteries to be clustered around the base of Lone Mountain, was dedicated in 1854. The three soon to follow were the Calvary Cemetery in 1860 and the Masonic and Odd Fellows cemeteries in 1864. For years the cemeteries acted as buffers to the westward expansion of the City into the Richmond District. In 1894, J.H. Bond, the feisty editor of the Richmond Banner, began to promote the removal of the cemeteries to Colma. 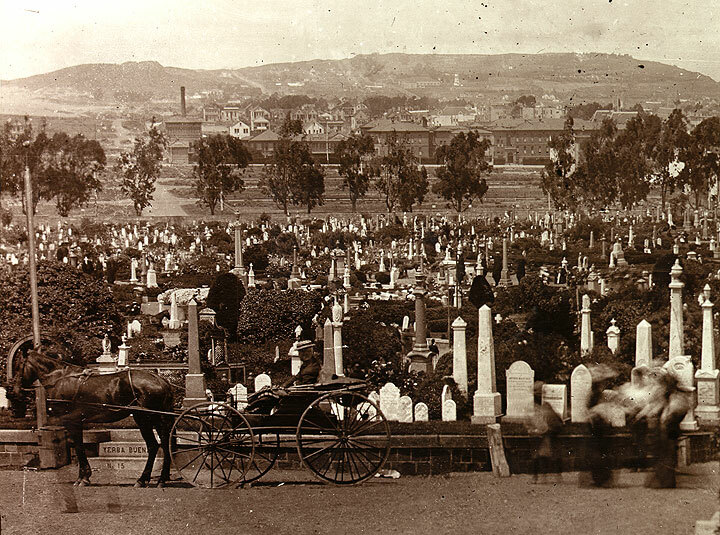 The battle to remove the cemeteries to Colma followed and continued for years, with groups such as the Cemetery Defense League an Save our Cemeteries fighting the evictions. By 1914, the Board of Supervisors ordered all bodies out of the city. In the 1920s, the Masonic Cemetery was purchased as a site for the University of San Francisco and the Odd Fellows Cemetery was vacated, leaving only the green-domed Columbarium. 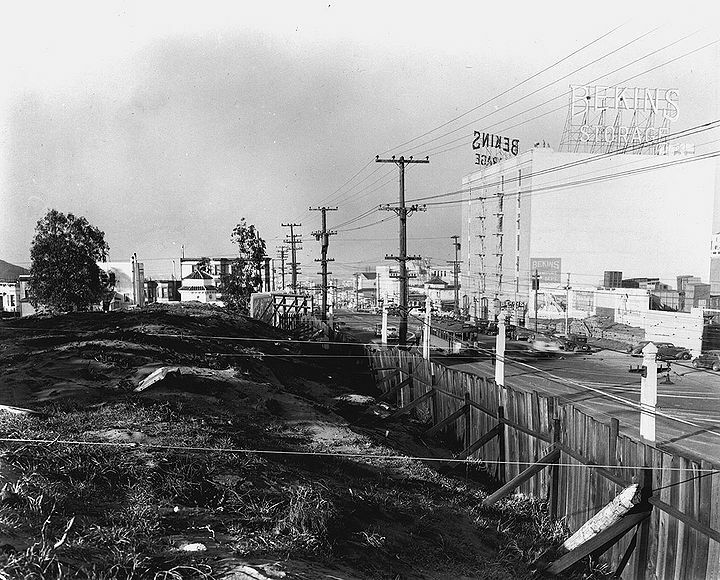 Calvary Cemetery was evacuated next, with housing, the Sears store and Kaiser Hospital being built on the land. Calvary Cemetery after clearance at today's corner of Geary and Masonic, June 26, 1946. Geary Street west from near Presidio Avenue with former Calvary Cemetery in foreground left, January 2, 1941. Geary Blvd. 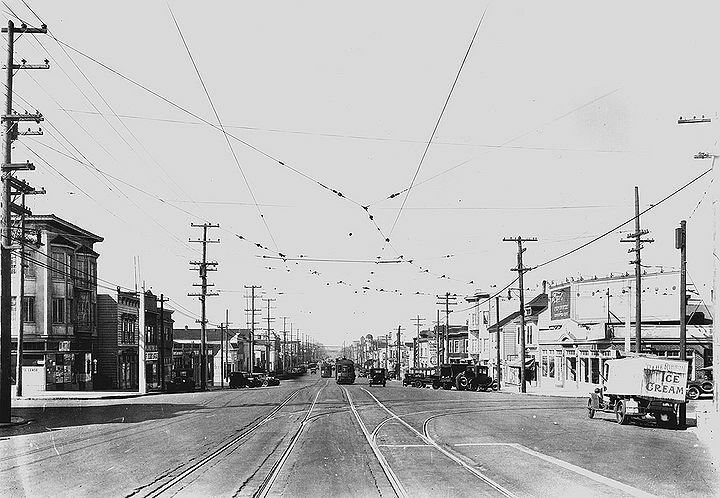 west from 2nd Avenue, 1926. 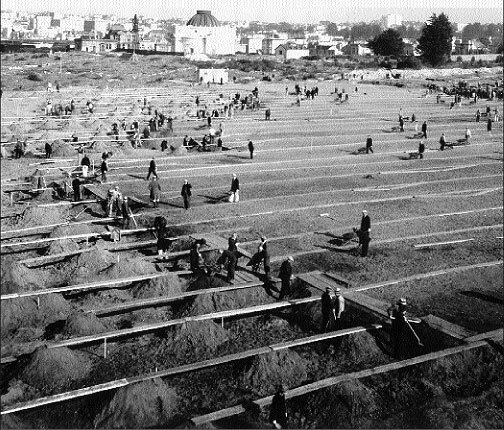 Clearing the Odd Fellows Cemetery to make way for Rossi Playground along Arguello Boulevard, 1933.